Initially facing challenges in trying to find his niche as he began college, Ibrahim De La Cerda said he went through several degree choices before finding his passion in Precision Manufacturing. Ibrahim said he entered STC right after high school and initially decided to pursue a degree in Education. After two years, he decided that Education wasn’t the right choice for him so he opted for Fire Science but realized that the program wasn’t what we was looking for. He took a year off from college to work and to try to find his calling. “When I came back, I went into the business track and I was there for a semester but once again I didn’t like it. I felt like I was wasting my time pursuing these degrees,” Ibrahim said. “But then I got a job offer from one of my dad’s friends who works in a machine shop. He hired me and I ended up liking it very much. “I told my boss there that I really liked this and if there was any way I could get an education doing this, and he personally brought me to STC and helped me get into the program here,” he said. “It doesn’t take much, it just takes finding something you really enjoy doing. It took me four years to find what I liked and what I was good at but I realize now that it was all about time and patience." Ibrahim is currently studying Precision Manufacturing and would like to pursue a career with Toyota or Cinch once he graduates with his certificate in December. The Precision Manufacturing certificate program, provides an environment to develop technical skills that are highly marketable to the area's industries. Most of the courses are set up to stimulate actual working environments. Technical coursework begins in the first semester in order to develop a common skill base for the program. From the first semester students learn how to use computers to read and use industrial prints, and gain technical skills. 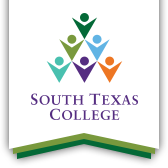 South Texas College, he said, gave him the confidence to overcome his obstacles and find his passion as he begins his career. “It doesn’t take much, it just takes finding something you really enjoy doing,” he said. “It took me four years to find what I liked and what I was good at but I realize now that it was all about time and patience.